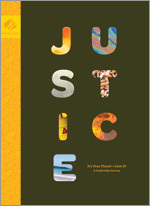 The "Justice" Girl Scout Ambassador Journey Book for eleventh and twelfth graders tackles the engaging global issue of environmental justice by giving girls the opportunity to create their own equation for justice. Along the way, they will see how "Doing the Math" with even the simplest acts can lead to powerful and positive changes in the world. From scientists and doctors to lawyers and environmentalists, this journey is rich with eye-opening career possibilities - all focused on caring and collaborative work that helps both people and the planet. The Ambassador "Justice" Journey Book is imported. Justice—for Earth and all its inhabitants—we all know what it is. Why is it so hard to achieve? Ambassadors realize that maybe justice needs a brand-new equation—their equation. By "Doing the Math" with even the simplest of acts, deciphering how decisions get made, and exploring how to use scientific evidence, Ambassadors will create and then present their own unique equation for what justice asks of us. Along the way, they will find they are also networking and gathering new ideas for college and careers. Ambassadors can also take some time out to Nest and Soar as they ponder new inspirations from birds around the world. When they add the Sage Award to their list of accomplishments, Ambassadors will be confident that they are they are the wise and healing leaders Earth yearns for! On this journey to JUSTICE, Ambassadors have the opportunity to earn the prestigious Sage Award by participating in activities in the six steps to understanding environmental justice. The Sage Award takes its name from the word meaning wise person (from the Latin root sapere, to be wise) and the medicinal herb (from the Latin root salvare, to heal or to save). The award represents both the commitment and ability to be judicious, and it reminds us of the importance of healing. While earning the Sage Award, girls explore justice (and injustice) from many angles including science, decision making and even doing a little math! Ultimately Ambassadors create and present their own unique definitions for Justice!